Well, I've been sick this week, just a cold, but today kept me pretty much on the couch with no energy, reading, watching TV, or sleeping. I finished 'The Girl With the Dragon Tattoo' and watched many episodes of reruns of sitcoms. I had 3 bowls of soup and some rice that I micro-waved. Then I remember my commitment to blog today and my commitment to make some kind of art today. How can I do that, when I can barely drag myself off of the couch? Well, as a True Addict, whether I'm sick or not I usually wake up EVERY morning and lay in bed for about 15 minutes thinking about the piece I'm working on and options and variations for it. I've learned to keep a notebook by my bed so I can write these ideas down because usually after I've taken a shower I don't remember any of the ideas. Whether I have time or not, I always take at the very least, a peek at TADA and RAW (Ring A Week). I don't always have the opportunity to comment, but I always look, every day. (That should be another group LAD (Look A Day) although I really don't know how we would record that!) My peeks always keep me excited to see what people are doing and motivated to keep going. Many times throughout the day, when I'm busy doing something else, cooking, cleaning, teaching, walking my dogs, ... my mind will always drift to wanting to work on that project in my studio. Especially, when I'm sick, it feels like such a waste to be sitting around when I could be working, but I know if I want to get better, I need to rest. 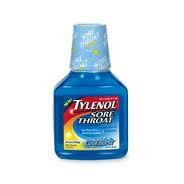 Sometimes my creative post for the day will just have to be an inspirational picture of the cough syrup that has been helping me get a goodnight's sleep! 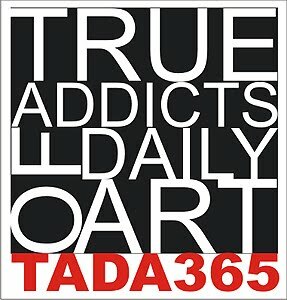 So what does it mean to be a True Addict of Daily Art? To me it is creating art everyday and when it is physically impossible then obsessively thinking about it and creating the ideas in my brain until I can get into the studio. Dear Evelyn, thank you for sparing some of your precious energy to write the post. It is extremely encouraging especially since there are many of us coping with similar problems. Before I had kids I used to have the same routine in the morning before I get up, because, you are right, many ideas vanish if they are not put on a paper. You just gave me a reminder to start doing it again. Anyway, wish you a good rest and a speedy recovery! I'm glad you documented this type of day too. We truly are addicted, aren't we? Hope you feel much better tomorrow.